. Inter-school Communication Days PNO!’s activity (named PONTE…NAS ONDAS! ), a day of communication and dialogue via radio between educational institutions from Galicia and the north of Portugal, carried out entirely by students. It has had 20 editions, and had participatied more than 800 educational institutions from Spain and Portugal, as well as from America and Africa.
. 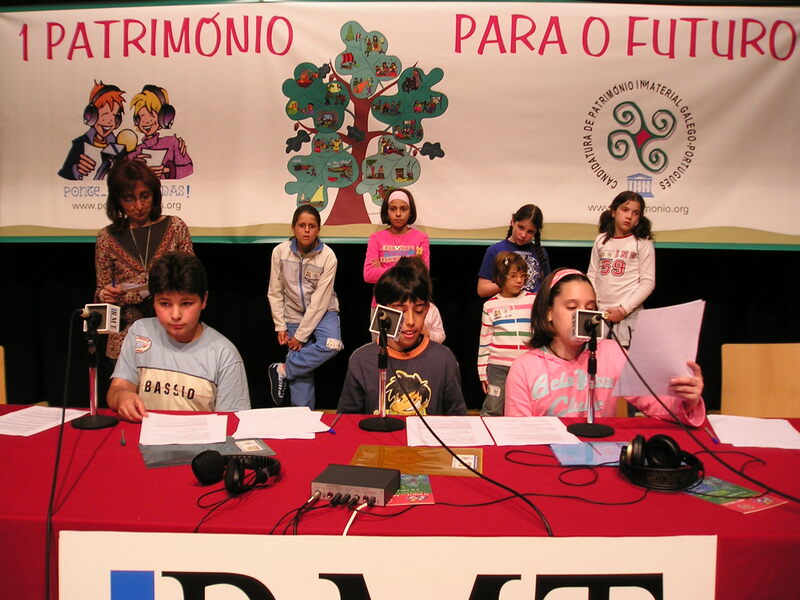 Samples of the Galician-Portuguese oral tradition aimed to disseminate the GPIH all along the Galicia-North Portugal Euroregion by joining oral expression, theater and music.
. Meeting of the Galician-Portuguese Intangible Heritage Bearers ( Melgaço 2005 ) aimed to give visibility to the Candidature of the GPIH presented before the UNESCO.
. Galician-Portuguese Oral Tradiction Collection Contest aimed to collect samples of the GPIH from an educational point of view, so the students can find out their nearest heritage expressions.
. Publication of books, CDs and DVDs related to the Galician-Portuguese intangible heritage: Meniños Cantores ( 2005 ), CD-Book-DVD; Cores do Atlántico ( 2010 ), CD-Book; Na ponte ( 2013 ), CD-Book-DVD; Living treasures of the sea ( 2013 ), Book-DVD.
. International Congress “PONTES DE CULTURA, PONTES DE FUTURO” (2010), the main subjects were education, the GPIH, the ICTs and the media.
. Galician-Portuguese Traditional Games Meeting aimed at educational institutions at both sides of the border.
. Candidacy of the Galician-Portuguese Intangible Heritage, presented by Spain and Portugal in 2004. It was the first candidature promoted by two educational institutions from two european countries. PNO!’s activities were awarded the seal “Buena práctica Iberoamérica” by Spain’s Ministry of Education; they also received the ONDAS award in 2014 for the “best media coverage of the Galician-Portuguese intangible heritage”. Main Safeguarding measures: a) identification, documentation, research (including inventory-making); b) preservation, protection; c) promotion, enhancement; d) transmission, (non-) formal education; e) revitalization. 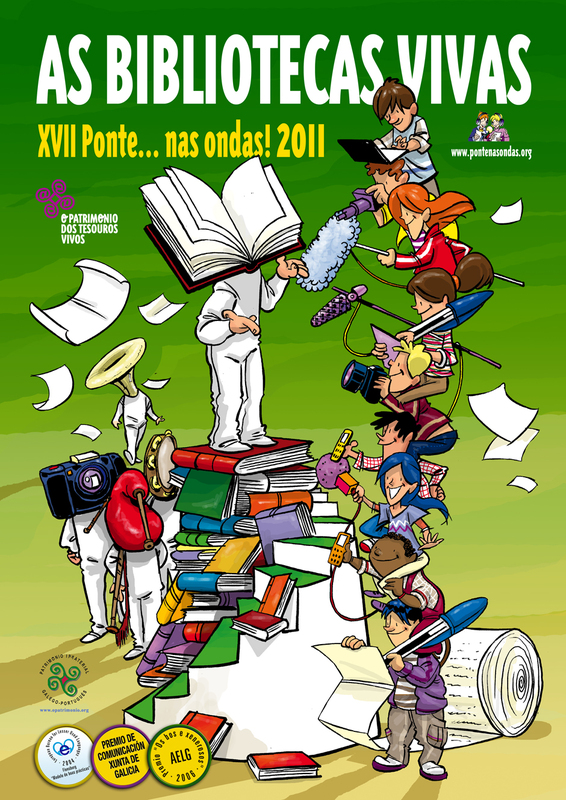 Throughout its history, the Cultural and Pedagogical Association PONTE…NAS ONDAS! has completed various initiatives related to safeguarding. IDENTIFICATION: Starting from the experience in schools with cultural heritage, participating Galician and Portuguese professors have found evidence of a common cultural heritage on both sides of the border. This identification was made concrete in the definition of five fields of traditional culture in which this cultural heritage maintains very similar cultural expressions, in Galicia (Spain) and Northern Portugal: oral expressions, the annual cycle of festive celebrations, traditional knowledge and trades, maritime culture and agrarian culture. In the International Congress of Social Pedagogy (Seville, 17-19 September 2003), with a report presented in the meeting minutes. In other congresses, organised by Galician and Northern Portuguese universities, such as Digital Divide (Silleda, 2005); International Congress of Social Pedagogy (Allariz-Chaves, 2007), 6th Luso-Brazilian Meeting on Education and Diversity: Dialogues and dynamics of inclusion (Porto, 2008); Borders and identities of the Raia between Portugal and Spain (Ribadavia-Chaves, 2008). In 2017 the project was presented in the 19th World Congress of Social Educators (UNICAMP, Campinas, Brazil). The association provides cultural heritage courses for professors. Researchers from PONTE…NAS ONDAS! have published works on this common cultural heritage. TRANSMISSION: Students carry out radio programmes, elaborate scripts on cultural heritage, make television programmes with the participation of culture-bearers spread their work throughout the network. 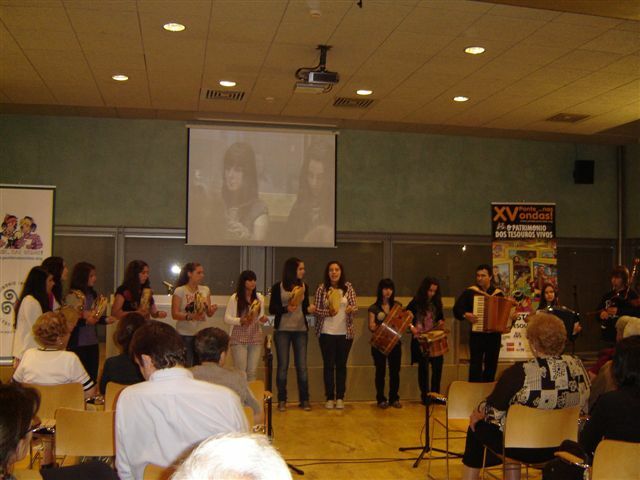 For 20 years, the Interscholastic Communication Conference has shown activities developed in educational centres and connects young people from the two countries, giving visibility to the various manifestations of the Galician-Portuguese oral tradition. In the Traditional Games Conferences and the Oral Tradition Collection Contests, the students themselves discover and show expressions of their common cultural heritage to the rest of the community. Beyond this, a specific project of recognition was carried out in A Guarda (Galicia, Spain) called Living Masterpieces of the Sea, to value maritime culture of the communities of A Guarda (Spain) and Caminha (Portugal). A website (www.opatrimonio.org) shares this cultural heritage throughout the world encouraging (re)creation and (re)production with the participation of the communities. Another website (www.escolasnasondas.com) is a platform for schools to publish and share activities and audio-visual productions. Ponte…nas Ondas! participa na 7ª Convención da Unesco sobre o Patrimonio Cultural en París | Ponte... nas Ondas! l’éducation est un comportement, nous sommes une ONG qui fait la promotion de l’éducation techniques et professionnel pour que la jeunesse puisse entreprendre par la suite pour leur autonomie. ONG PADJENA EST DANS l’éducation bourses technique et professionnel, formation et orientation scolaire et professionnel. In Spain: Rúa Colón 17, 6º D . 36201 Vigo. In Portugal: Azenhas 21 - 4930341 Ganfei. Valença do Minho.